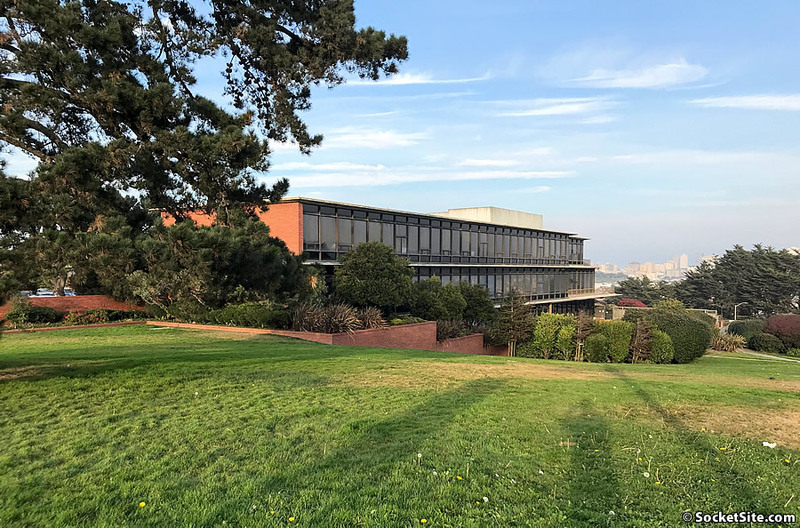 The bid to formally recognize the modernist building at the center of UCSF’s 10-acre Laurel Heights campus as historic, a move which was initiated by opponents of the proposed redevelopment of the campus, as we first reported earlier this year, has been successful. Supported by both San Francisco’s Historic Preservation Commission and the State’s Historical Resources Commission, the Keeper of the National Register of Historic Places has determined that the building at 3333 California Street is eligible to be added to the National Register. 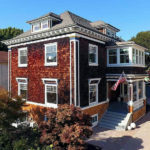 And while the property cannot be added to the National Register without the property owner’s consent, an addition which the new ownership team wholeheartedly opposes, the Keeper’s determination automatically lists the property in California’s Register of Historic Places. While being listed in the Register doesn’t preclude the redevelopment of the campus, it does provide cover for a litany of legal challenges and potential delays. But the development team has a plan. 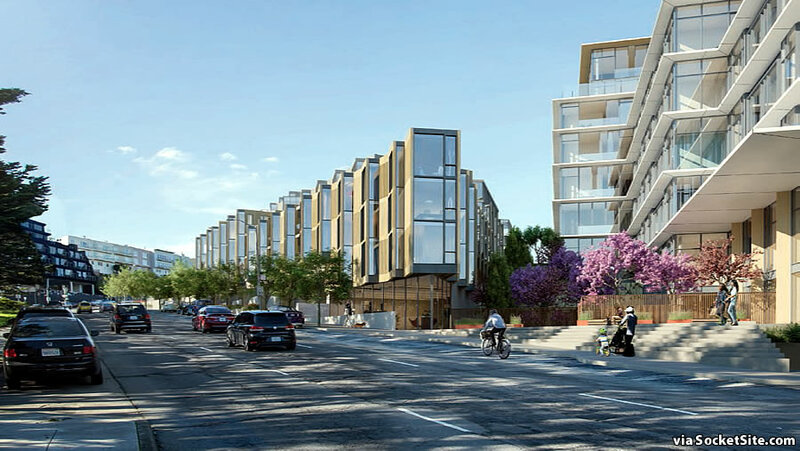 As successfully employed by the Golden State Warriors in their bid to secure approval for the development of their new arena rising in Mission Bay, SKS Partners and the Prado Group have now requested that the Governor of California deem the proposed redevelopment of the Laurel Heights campus as an Environmental Leadership Project. And while such a designation wouldn’t automatically lead to the project’s approval, it would require all legal challenges to be resolved within a year. 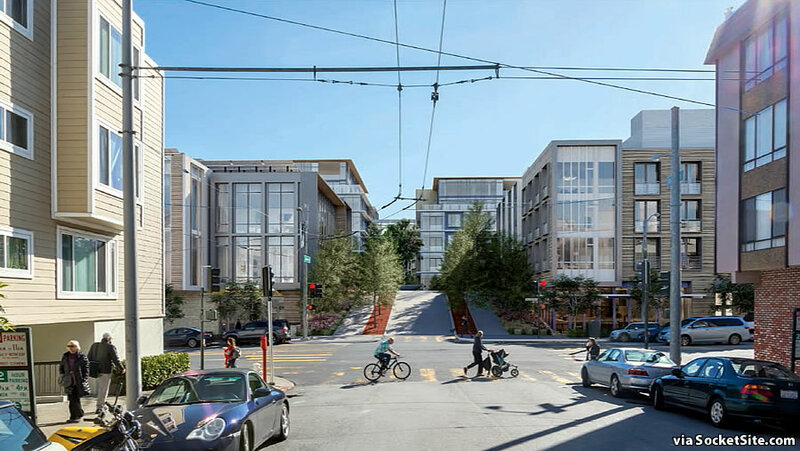 Once again, the project as proposed would yield 558 residential units; 49,999 square feet of office space; 54,000 square feet of retail space; a new 15,000 square foot child care center; parking for 896 cars (and 592 bikes); and 236,000 square feet of open space, as rendered below. And as currently envisioned, the project would be constructed in four overlapping phases over the course of seven years, with the first phase breaking ground in 2020 if the entitlements to proceed are secured. We’ll keep you posted and plugged-in. It’s time to garbage the whole historic preservation process. It’s absurd that this ugly modernist blandness gets counted, and even more so that the governor has to get involved. No, it’s not actually. 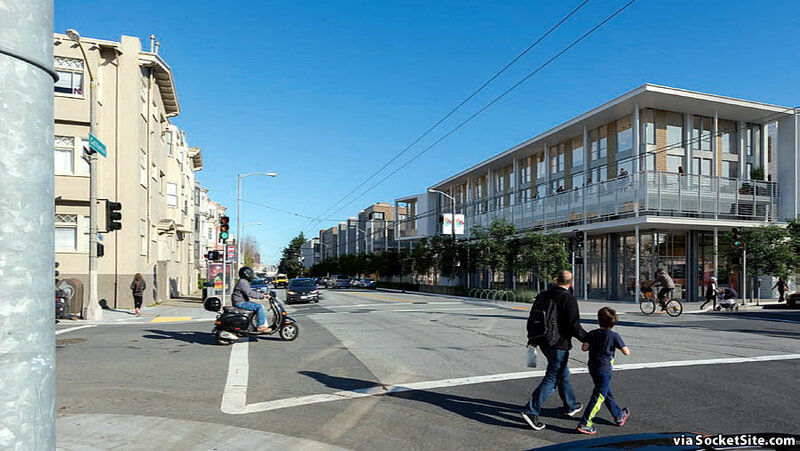 Historic preservation has not only preserved the character of countless U.S. communities, including San Francisco, but it is a valuable economic tool. Federal rehabilitation tax credits have been crucial in the investment of billions of dollars in older communities across the nation. Even some Republicans like it. That said, preservation does get abused from time to time by NIMBYs who could not give a fudge about a property until a development proposal comes up. I am a preservation architect, but I believe that this property, while not without some redeeming qualities, is not National Register-eligible. But someone who has studied the property more than I did obviously put together a convincing case report. This doesn’t mean it can’t be torn down. National Register listing is purely honorific and has few teeth. But it does give the NIMBYs some leverage. But it’s not just NIMBYs. It’s the system itself in SF. It needs to be scrapped. Nowadays you have facades with aux stone veneer facades or asbestos shingling falling into the default 50 year historic review guideline. There will be expense and months upon months of time lag to hire a historian who will ultimately spend an afternoon filling in a template. And even when the report is in various DBI parties will pass the buck and cause more months delay. It is time to scrap the entire thing. Please stop the obstruction.This is asinine. We have a housing shortage. For the residents of the area who will be faced with 600 new cars going in and out, it’s more like an infrastructure shortage. Also, did you see the new study? More millennials now live in the suburbs than the city, and less than 20% have homeownership as a major goal. “Demographics is destiny”. The reason millennials are giving up both on urban living and homeownership is they increasingly can’t afford either. I’ve seen it myself over and over, and silly obstacles to building housing don’t help. Millennials have given up on urban living? The folklore was that millennials prefer the city. The reality is that young people prefer the city, and the millennial cohort is getting older. They are starting to have kids, and who wants their kids assaulted by mentally insane drug addicts? Also they’re not really priced out of cities, just the fancy neighborhoods they like. To add insult to injury, their Robinhood account full of tech stocks has been recently crushed by 30-40%. Uh, no, that’s not how it works, actually. If this was Dallas we could be more cavalier about old buildings, but not here. History, culture…..remember those things…….that is why people come to San Francisco, or at least it used to be before all the STEM dorks flooded in. uh, no. Nobody visits this site for its architectural wonder. What do you propose that is of greater value? Nothing. Just obstruction. Take it easy. I don’t care about this building or what happens to it. I am just providing a little push back to the knee-jerk anti-preservation sentiment on this site. Republicans destroyed the effectiveness of Federal Historic Tax Credits last year by making the 20% credit available over five years instead of it being one payment when the historic building is opened. The full effect of this has yet to be felt as most existing projects have been grandfathered in to the old rules, but new historic projects, one has to imagine, will be harder. Gee, they gave John his park and he is still unhappy. At least there’s a hidden silver lining for New Urbanists here. 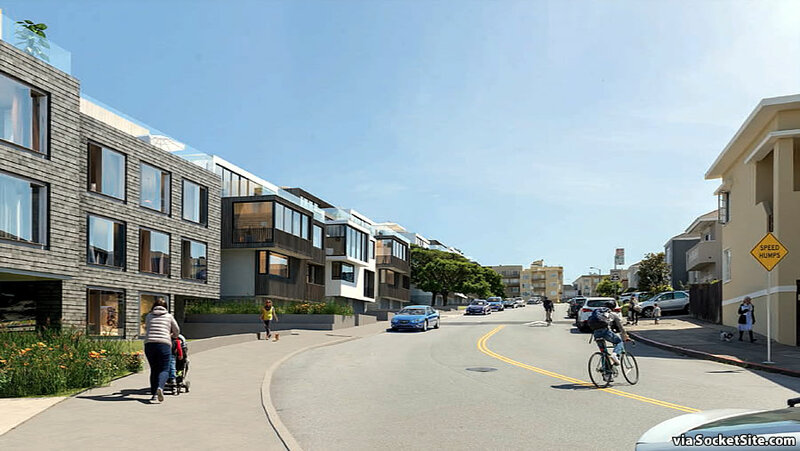 SB 734, codified at Public Resources Code sections 21178-21189.3, would appear to require the proposed 896 car parking spaces be rented or purchased separately from housing units (unless the project is an affordable housing project subject to legal requirements that do not allow such unbundling, and it doesn’t look like this one is). That assumes the Environmental Leadership Project status is approved, of course. The fact that this is a mixed use project will be an interesting wrinkle. Why not set aside some units for the doctors to purchase at a favorable price to keep them from buying elsewhere and having to commute in for work? Kaiser, UCSF, etc. Each doctor has hundreds of patients. Surely doctors over NIMBYs, unless NIMBYs don’t need health care. Yes, affordable housing for… …Doctors! I have had two physicians gentrified out of San Francisco. It’s not just about the baristas anymore. I generally like SKS’ work but not in this case. This is a rare and really nice open parcel on a hilltop that could have and should have been preserved. Period. They need to mandate roof decks and/or solar panels on that project. Period. I really do wish they’d cut back on the crazy amount of parking for this project. But I guess priority number one is to avoid whining (and lawsuits) by a bunch of Tesla and Land Rover drivers. Priority number two is apparently preserving big lawns. This is insane. This city has a chronic, acute housing shortage – this “historic preservation” effort is unconscionable – it’s only been employed because people don’t want change. It’s nothing but selfishness. Does anybody know if the height limits for this project prevent new additions allowing Golden Gate Bridge views? 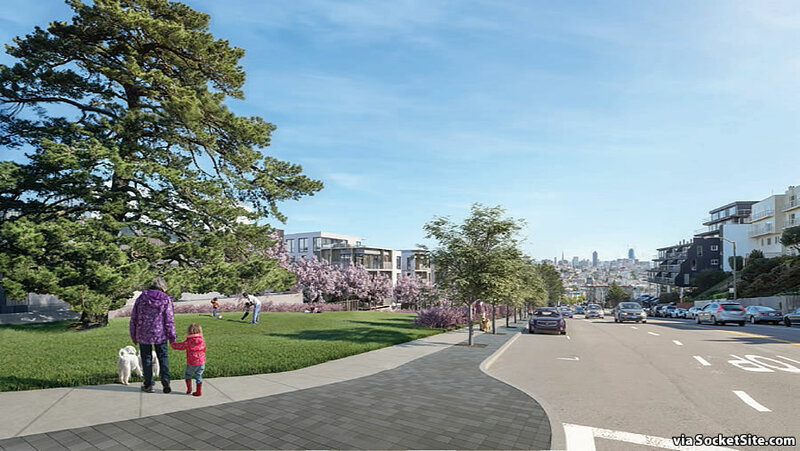 The property siting already allows for the downtown city and east bay hills view. What a selling point if they can now include the GGB…. That would be my vote. Go high and preserve the landscaping. I work in this building (it’s a disaster and I would love to see it torn down, but I suppose the army of rats will be happy to have their space undisturbed). There are already GGB views from the western side of the building, for what that’s worth. The views have lost some appeal because the university stopped washing the windows several years back when they decided to move out, but the bridge is definitely visible.